The purpose of this letter is to present the documentary film “Death in Tehran” that portrays the politcal murders of my parents Dariush and Parvaneh Forouhar. They were the first victims of a politically motivated series of assassinations in the autumn of 1998 in Iran that generated a huge wave of protest both within the Iranian population and also abroad. 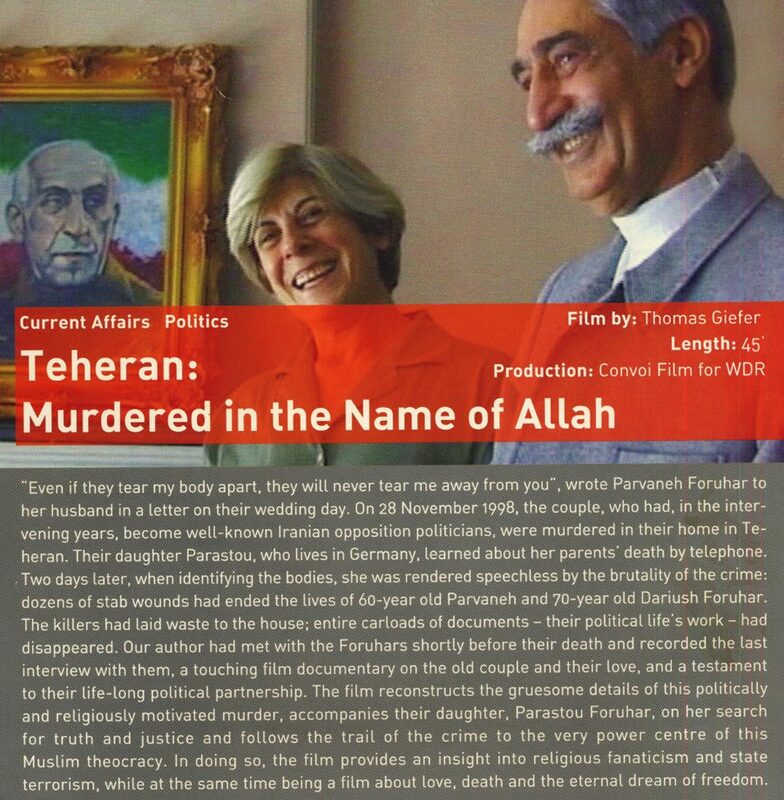 The filmmaker Thomas Greifer interviewed my parents a few weeks before their tragic murders and has since then subsequently follwed a large part of the drive for resolution, a failure of the Islamic Republic’s state power. The film gives an insight into the attitude with which the couple sought to implent democratic structures in Iran and shows the pair of them in the light of their deep connection with one another. Speaking today, I think that such contemporary documentaries are of vital importance because they speak out against passivity and forgetfulness. This is of special importance right now because reports such as this can open people’s eyes to a democratic vision that many in Iran follow at the cost of their own lives, as the repressive methods of the Islamists in Iran are blocking the processes of democratisation on a political level and the current threat of war is distracting the Iranian population from their own state of affairs and problems. My last trip to Iran in November/December 2004 took place on the occasion of the sixth anniversary of my parents’ death and left me with a depressing picture of the social situation. The process of reform has come to nothing and disappointment has led to feelings of resignation and hopelessness in large sections of the population. The increasing terrors of the state, alongside the struggles for power within the system, are draining the powers of those working for change. International support in this situation is essential for the democratisation process.